This type of bit uses tungsten-carbide as the cutting media. Tungsten-carbide does not possess the hardness of diamond and as such has a limited range of application as a core drilling cutting media. T.C bits are however a very cost-effective means of drilling softer unconsolidated formations. These bits are set with rectangular-shaped or octagonal-shaped tungsten-carbide elements that are physically embedded into the crown of the bit. The bit crown itself is composed of a tough, wear resistant metal-bond matrix material. The application of this bit is primarily in geotechnical soil investigation or for core drilling in overburden layers that are mainly composed of clay, sand, gypsum or soft shale. The cutting media used in this type of core bit are crushed tungsten-carbide that are bonded in a metallic alloy, This type of core bit has more cutting edges than the regular tungsten carbide bit (TC bit) and as such have a wider range of application in some formations. This bit is similar to impregnated diamond core bits in that the bit crown is composed of several layers of cutting media. The bit face regenerates itself with new cutting edges by wearing away the metallic alloy during operation to continually expose new layers of carbide-chips until the bit crown is consumed. 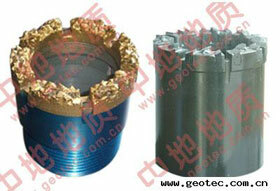 We are a professional tungsten carbide bit (TC bit) manufacturer and supplier in China. We have gained the recognition of a large number of clients through our 20 years' production experience and marketing and serving experience, and meanwhile we have accumulated abundant experience in terms of products. At the same time, we keep researching tungsten carbide bit (TC bit) that can better meet the clients' needs and the market. Our bits as tungsten carbide bit (TC bit), carbide core bits have been exported to South America, Africa, East Europe, Southeast Asia, and Middle East. We have clients in America, United Kingdom, France, Canada, Australia, New Zealand, Philippines, Indonesia, India, Chile, Brazil, Russia, Algeria, Morocco, Malaysia, Thailand, Pakistan, Mongolia etc. Located in Wuxi, near Shanghai, the biggest port city of China, we are provided with convenient transportations of any kind, by land, sea or air, which will greatly reduce your transportation cost. To meet the clients' different demands, we can provide all kinds of geological drilling tools, such as impregnated diamond bits, impregnated diamond bits, diamond core bits (synthetic natural), reaming shells, PDC bits, core barrels, drill rods. If you need them, please contact us.